36% of the mangroves of Mexico have been changed or replaced. On the Yucatan’s Peninsula, the damage comes also from non-organized tourism and human settlements (Photo: PRWeb). Thirty-six percent of Mexican mangroves have been changed or replaced, and the Yucatan’s Peninsula, home of 55% of them, also presents great damage on these coastal ecosystems, caused by non-organized tourism, over-exploitation of species and human settlements. 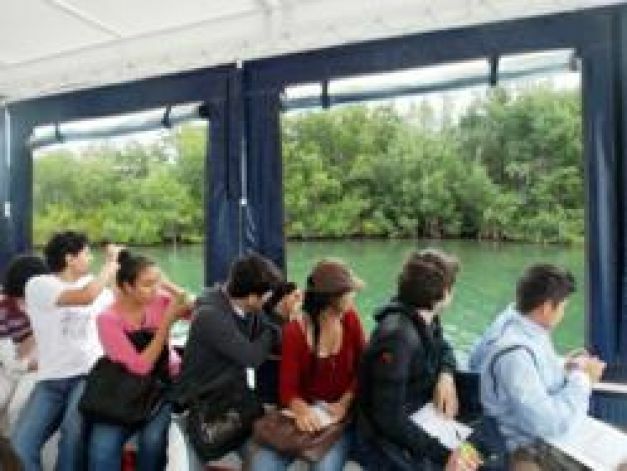 On the workshop titled “Introduction to the Management and Conservation of Mangroves” organized by the tourist group Sunset World Resorts & Vacation Experiences to commemorate World Wetlands Day, the Secretary of Environment and Natural Resources (Semarnat) in Mexico, added that the state of Quintana Roo have the second place on mangrove territory with 16%, only behind Campeche. This course, given jointly with another Mexican agency, the National Commission of Protected Natural Areas (Conanp), was directed to students of the Environmental Engineering, Sustainable Tourism and Hotel Management degrees of Universidad del Caribe. One of the main points of the workshop was that mangroves are endangered not only in Mexico, but internationally by other factors like water pollution, coastal erosion, natural disasters and climate change. “50% of the world’s wetlands have been changed, and a great part of the other 50% is deteriorated. Specifically in Mexico, around 64% of mangroves are still untouched, but we have changed or replaced 36% of them,” pointed out the biologist Teresa Jimenez, head of the Environmental Education department of Semarnat. The tourist group, through it 2 branches, Hacienda Tres Ríos and Sunset Admiral Yatch Club, coordinated this course for 25 Unicaribe students to teach them about the characteristics and present condition of the wetlands as well as the causes and effects of the main environmental problems affecting them. On this tenor, Semarnat emphasized that the growing of human settlements on the coastal zones, caused by the world’s tendency of living near the sea to perform activities like recreation and tourism, and the rising of sea level due to climate change “could irretrievably damage the coastal wetlands” causing a modification on species and cutting down its productivity. On this workshop, we learned that wetlands cover about 4 to 9% of the world, and some of the benefits that they bring are: capturing an important amount of the atmosphere’s carbon, provide nutrients to the sea, act as a refuge and reproduction zone, their appeal for tourism and recreation, to serve as natural sewer treatment and to recharge the water tables. Gabriel Santoyo, Sustainable Development Director of Tres Ríos, on his lecture showed the features that make this ecotourism complex an example of sustainability on an international level and the efforts to save the mangroves on the state. The workshop was three days long. Two days of lectures on the Unicaribe’s classrooms, and one more of practice on the Sunset Admiral Yatch Club, where students and lecturers boarded a trimaran to visit some locations of Nichupte Lagoon. On this trip we heard a lecture on the situation of the mangroves given by biologists Teresa Jiménez, head of Environmental Education, Pablo Rubio Taboada, technical assistant of the Protected Area of Nichupte Mangroves and Gabriel Santoyo, Sustainable Development Director of Tres Ríos. The students also enjoyed the marina facilities, a brunch and diploma for their assistance to this workshop.